On December 14, 2018, FASTPORT and dozens of industry leaders will publicly pledge to promote the mission and activities of the Employer Support of the Guard and Reserve (ESGR) in an official signing ceremony in the Pentagon. at 2:00 p.m. Sample of the Statement of Support organizations will sign during the signing ceremony at the Pentagon on December 14th. We cordially invite and challenge you to join as we honor America’s Citizen-Warriors by signing a Statement of Support for the 1.1 million members of the National Guard and Reserves. 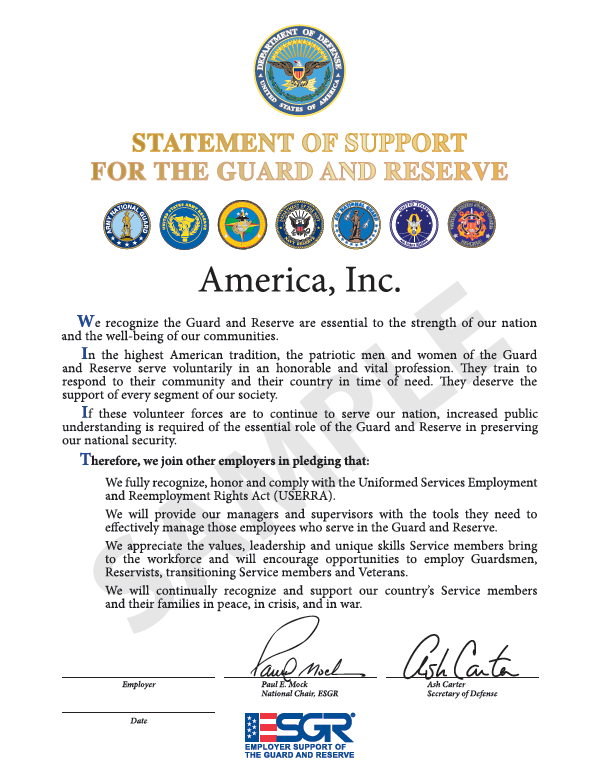 By signing a Statement of Support and posting it conspicuously within your organization, you are publicly affirming your company and your overall industry’s support for the brave men and women who serve voluntarily in the National Guard and Reserve. Such a commitment can make an important difference for your community and the nation, especially at a time when service members are returning home to find their previous job may no longer exist or there are limited new jobs available. By participating in this 4th annual, cross-industry Statement of Support signing ceremony, your company can help demonstrate to our Veterans, Guard and Reservists that your industry is a First Responder in Veteran employment. If your organization has already signed a Statement of Support, we encourage you to sign again as a re-affirmation. You can read more about the Statement of Support here. Employers and organization representatives photographed following the 2017 Statement of Support Signing Ceremony. Thank you for your interest. Registration is closed for the 2018 event; however, we welcome you in 2019!